It’s been a busy spring here at Clinicminds. Besides developing new features our focus is always on constantly listening to your feedback and improving our application. We have summed up some of our major updates and new features below. We’ve improved the calendar for use throughout the day! Completed appointments are now dimmed (shown lighter), making it easier to see which appointments are still open. Also, we now show an icon for no-show appointments, both in the calendar and on the dashboard. The first name of clients is now shown after the surname in the calendar, making it easier to greet clients by their first name. You can now choose per individual appointment whether the client may reschedule or cancel via a link to the online scheduler. You can still set up default settings in the app via ‘menu > Settings > Calendar/Booking Settings’. When adding or editing an appointment from the calendar, you can now override these settings in the appointment popup. It’s now possible to edit a record after closing it, as long as it’s not been invoiced. 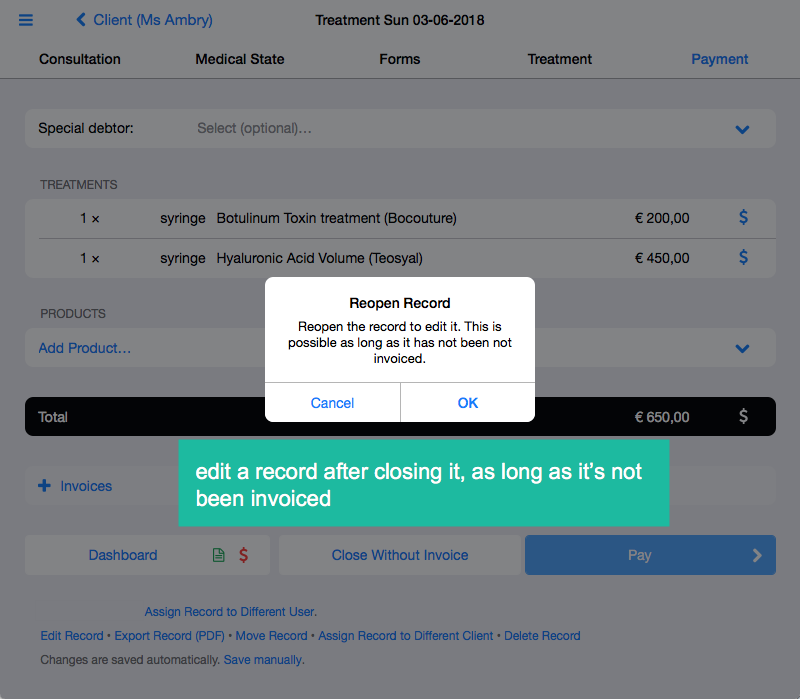 Many users sometimes make mistakes in the treatment data (e.g., wrong amount), which they notice during the payment when the record has already been closed. As long as a record has not been invoiced, it’s now possible to reopen it again using the ‘Edit Record’ button at the bottom. If the record has been invoiced, it’s still possible to edit the invoice as before, though this requires a special user permission. We added a ‘Product sales’ report, so you can easily export all clients who purchased a product. We also added the price to the ‘Treatment data’ report, so you can see how much a client spent on a treatment. We now show ‘Resend’ buttons for all messages that can be sent from the app. This makes it easier to send something again if the client lost the original message. The phone number input in the online scheduler has been greatly improved! It’s no longer necessary to enter the mobile phone number in international format (beginning with a ‘+’). If clients live in the same country as your clinic, they can just enter their number in ‘local’ format. We now also show a clear explanation about this. 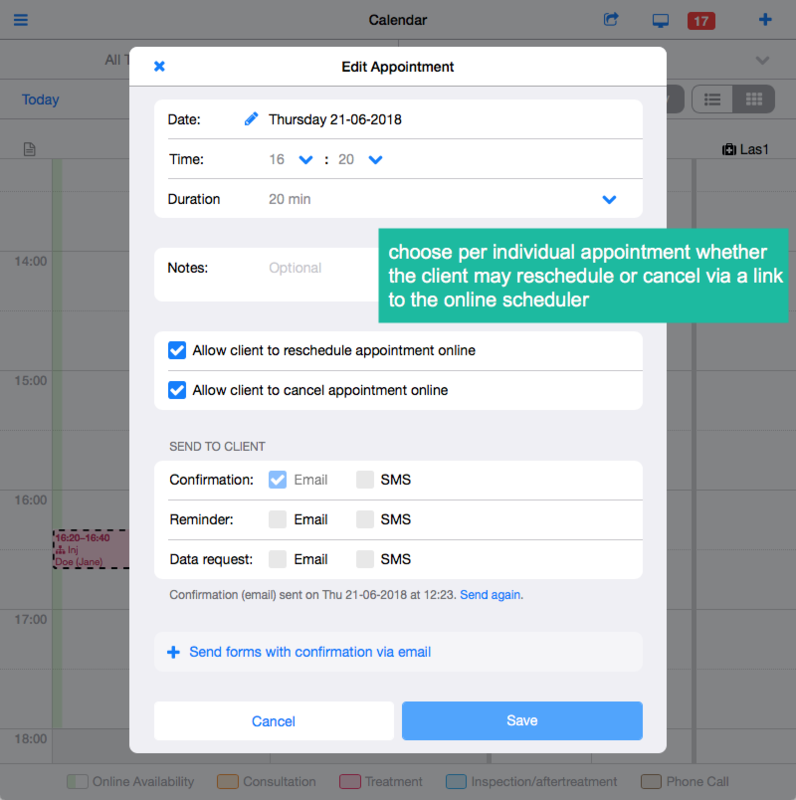 It’s possible to show an explanation for the different appointment types in the online scheduler (consultation, treatment, inspection, after-treatment). E.g., if you want to mention that treatments may only be booked after having a consultation, this can now be done! You can set this up in the app via ‘menu > Calendar > Services’. Various visual improvements in the online scheduler.